Last Saturday was quite the day. Our family celebrated the first birthday of our firstborn daughter, Stella. 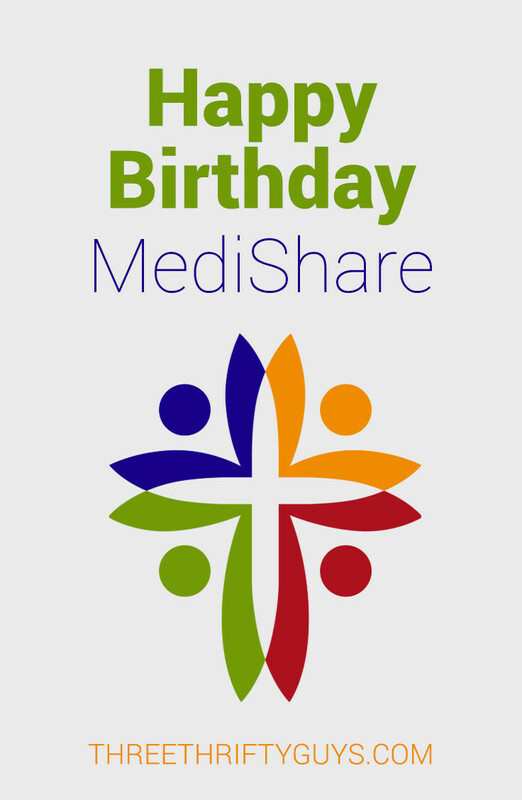 We also celebrated year one under the coverage of Medi-Share®, the medical cost-sharing plan that I’ve wrote about before. Now we didn’t celebrate the 365th day of Medi-Share coverage by smashing our faces into food or riding around in a new Cozy Coupe, but it is ironic how similar our first year with Stella has been to our first year with Medi-Share. Here are some things we learned about both. As of last check, I think our list of parent-fails has grown to 246. But after the tears, you laugh as long as everybody is okay. We made some mistakes with our Medi-Share switch because everything was new also. The main difficulty was getting used to a workflow at a particular doctor’s office. Our pediatrician was located at a practice that was labeled “in network,” but it took some trial and error to figure out how to best introduce ourselves as covered by Medi-Share and how billing should work. Watching Stella try to climb up stairs is kind of like watching a doctor’s office assistant try to comprehend that we don’t technically have insurance, but the bill still needs to be submitted to another company she may not have heard of. God bless grandparents… so helpful they are (maybe a tad over helpful, but beggars can’t be choosers). I think the coolest thing about our first year of Medi-Share was seeing other people come on board to the medical cost sharing train. There is a bit of a risk that we felt taking this step. And some people give you the eyebrow raise of concern – like my friend sometime asks, ‘how that’s fake insurance thing going?’ There are skeptics but more and more people are saying enough is enough with the ridiculous situations that paying for health insurance puts you in. Raising Stella has been amazing, but it hasn’t been a free endeavor (who knew?). The cost of Medi-Share is the reason we were attracted to the coverage, and why we’re sticking with it for another year. Our monthly cost raised this month $40, to a total of $300/month for my wife and Stella combined. The annual household portion that my wife and I will pay (basically an annual deductible) is $3000. Just from our savings in year one alone, we were able to stock away that money in an HSA to cover all medical expenses next year. Here’s a quick breakdown for a year in review. Basically we saved $600 per month, and $7200 this year from the switch! And we didn’t even experience the savings on the lower deductible. I wrote previously about how I was hoping to never write a follow-up article in my reverie that Stella would never get sick. The daydream is still reality, because Stella has only had to go in for regular check-ups! These bills were submitted to Medi-Share, knocked down by about 30%, and paid for as part of our annual household portion under $3000. The sad thing is…I’ve seen Stella try and walk and it’s not pretty. It’s only a matter of time before that first trip to an urgent care facility happens. I would not have pegged myself as a guy who scrolls through photos of his daughter when he’s bored to get a quick laugh or a smile, but that’s the reality. Even after taco-meat tantrums, it’s easy to see that we wouldn’t trade the opportunity to raise Stella for anything. And with Medi-Share, we have come to a point where we have accepted that there really isn’t any other option for us. We reevaluated our coverage after year one, and the difference in the bottom line is too staggering to go elsewhere. Year one with Stella and Medi-Share has been a wild but fulfilling ride. What about you? How have your health insurance options changed this past year? Anybody inching closer to medical cost-sharing? TTG may receive compensation for services purchased through the links on this post, at no cost to the reader. Thanks for helping to support the website. Its 12:36am and I’m worried about the cost of my families bluecross blue shield of Texas. We are so behind on the premiums im just waiting on the cancellation notice. It’s depressing as a father and husband. So im now looking into this, medishare, liberty healthshare, alieracare, christan health ministries. Its a lot of info. Sorry to hear Ken. It’s tougher for families today – healthcare costs are definitely out of hand – esp if you don’t have coverage through an employer (and even then, as they try and make the employee shoulder much of the burden). I know Medi-Share has worked well for Matthew and his wife (child) and has greatly lowered their medical costs.